From what I have heard DJ FORMAT and SIMONSOUND tore the roof off the muthaf#cker at THE CONCORDE in Brighton at last Friday's album launch for "Satement of Intent". When was the last time you heard someone rocking the vocoder live on stage and producing synchronised audio and visuals throughout the night? Mature B-boy DJ FORMAT certainly has come of age in respect of both his music and his physical presence on stage. Those who missed the Brighton gig can catch more of the same this Friday at the JAZZ CAFE in Camden Town, show begins early at 7PM so get there early to avoid disappointment. Myself and BEAT DETECTIVE shall be there along with our VINYL VETERANS crew members and of course the other heads that are likely to turn up. 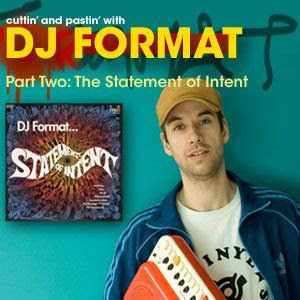 Plus you can read the second part of DJ FORMAT's interview on DIGGERS WITH GRATITUDE (peep it here) as he and SURESHOT LA ROCK discuss the making of "Statement of Intent" album track by track. And here's some trivia for you - the lyrics to the track "A QUICK EGO TRIP" on the album was originally penned by SURESHOT over a vintage DAILY DIGGERS beat that he spotted on our Myspace page some years back. FORMAT loved the lyrics, flipped a new beat for the track and after polishing until bright the slamming joint "A Quick Ego Trip" was born - thanks for the credit fellas! Yo! looking forward to seeing my Daily Digger / Vinyl Vet brothers at this! ..Brighton show was dope ..don't sleep if you can reach this tour! !